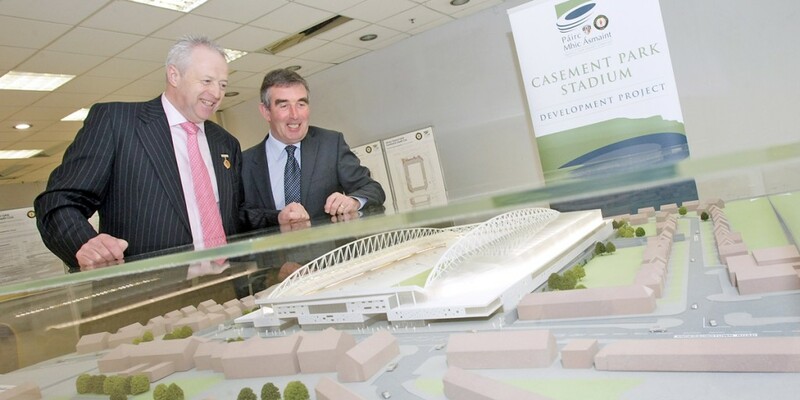 A 3D scale model of the proposed Casement Park Stadium has been laid out for public viewing at the Westwood shopping centre. The model was unveiled at a press conference yesterday (Wednesday) and will be displayed for the community to view for the next two weeks. The stadium team have undertaken widespread community and stakeholder consultation with the outcomes feeding back into the design team and it is these consultations that have been a key consideration in bringing the design concept forward. It’s hoped that the 38,000 all-seater stadium in the heart of Andersonstown will be opened in just over two years time. Speaking to the Andersonstown News yesterday, Project Board Chairman Tom Daly said this was another forward stage in the stadium’s development. “We are now in the final phase of the design consultation process which has been ongoing since April 2012. “When people come to view the model they can see how we have worked with the design team to have the structural steel on the inside of the stadium in order to minimise the scale of it. Meanwhile, the Andersonstown News has learned that MORA (Mooreland Owenvarragh Residents’ Association), who are bitterly opposed to aspects of the Casement Park development, are considering whether to protest and hand out leaflets at major GAA matches at Casement this summer, including the next Ulster Championship football match due to played at the Andersonstown stadium on June 9 between Antrim and Monaghan. Wednesday June 5 3pm-8pm (this session to include design team representatives).